The Canberra racing community has already been a rock, now Ben Kirkup hopes the sport can help his father's mental and emotional recovery. Canberra trainer Garry Kirkup is out of hospital and staying with fellow trainer Luke Pepper as he continues to recover from the car accident that killed his partner Samara Johnson a month ago. It will be at least six months before he can consider returning to ride his horses' track work. In the meantime the plan is for Kirkup to ease his way back into training, with several riders - including Richie Bensley - set to take over the track work duties. Part of that will be getting Highly Geared ready for her autumn campaign. The eight-year-old mare has won the last two Camarena Handicaps on Black Opal Stakes Day at Canberra's Thoroughbred Park and will be looking to make it a hat-trick on March 11. Suffering not only the physical effects of the crash, Kirkup's also trying to get over the loss of his partner and colleague in Johnson. 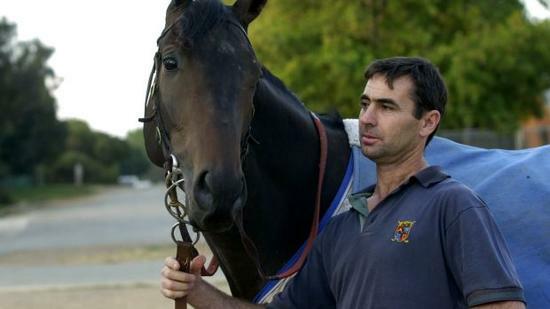 Johnson also rode track work for Kirkup, along with competing as one of the leading jockeys at the picnic races. Kirkup's son Ben hoped the sport he loved could play an important role in the grieving and healing process. "He's as good as can be expected I guess. It's going to be mentally a bit of a tough road," he said. "But he's got a lot of support from the racing industry and a few horses will start to come back in in the next few weeks and he'll slowly get back into it. "The horses will probably play an important role in keeping him mentally busy and something to look forward to with Highly Geared for the Camarena. Work could help. "He's in as good spirits as he could be in the situation he's in. "He's starting to talk about the horses, which is good signs, and looking forward to getting him there to keep his mind busy with what him and Samara used to love doing." The Canberra racing community has rallied around both the Johnson and Kirkup families. Races were held in Johnson's honour both in Canberra and Trangie, while several trainers did their part by getting Highly Geared to the Sydney races just days after the accident in what was called "horse racing's greatest ever seventh". Pepper has opened the doors to his home, with Kirkup needing somewhere to stay that's wheelchair accessible. Now it's hoped Kirkup will be able to return to steering the ship himself in the coming days with the track work duties getting spread out. Ben Kirkup said his dad might find it frustrating not being able to do the riding himself, but was confident he would get back there once his rehabilitation was complete. "Traditionally he's always been a very hands on trainer, riding a lot of his track work, but things will be changing a little bit at least for six months," Ben Kirkup said. "He'll be more training from the ground. We've organised a few track riders and jockeys to commit to a few horses a morning each so we can get most of the team back in. "There's plenty of trainers that don't ride work, I'm sure it will frustrate him, but he'll get there in the end and get back riding."